Compliant with BS1722 part 9, our steel bow top fencing offers a high quality fencing whether it is for aesthetic or security purposes. 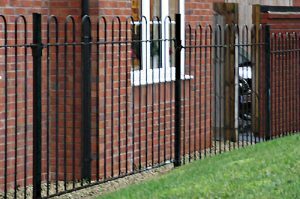 Bow top fencing can be supplied in standard panels with matching gates from stock or manufactured in non-standard length, raked or radiused panels to suit individual requirements. The bow top is manufactured as a minimum to comply with BS1722 part 9 where applicable and is available hot dip galvanised to BS EN 1461 or galvanised and polyester powder coated and in heights ranging from 600mm to 2000mm. Gates in any width or height can be manufactured to suit all our bow top designs. If you require bow top steel fencing security panels please contact us. We have competitive prices for the whole UK steel gates and fencing market.